It’s difficult to remove mold. It’s expensive if you hire professionals. It’s time-consuming (and kind of gross) if you do it yourself; it also can endanger your health. But once it has settled in, there is nothing you can do but get rid of it. How much better would it be to never have to deal with mold in the first place? Lots better! Take a little bit of time and a little bit of money to prevent mold from infesting your home. Here are our five favorite ways to make your home inhospitable to mold. 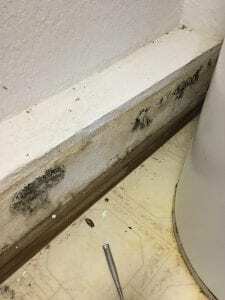 In general, mold needs only 24-48 hours of moisture to develop. Don’t discount the danger of letting even the smallest wet spot or a single wet item go unattended. · Dry up any water immediately, e.g., in your basement after a heavy rain, around a leaky pipe, a simple spill on a carpet. · Dry the floor and walls after a shower. · Don’t leave towels or similar items lying around. · Don’t leave wet clothes in the washing machine. · Take water-damaged carpets, bedding and furniture outside to dry. · Or remove them permanently if drying them isn’t going to help. This is especially important, because there are species of mold that can grow merely because the humidity is too high for too long. The U. S. Environmental Protection Agency advises keeping indoor humidity between 30 and 60 percent. You can buy a humidity meter (hygrometer) at a hardware store for $10 or less. Also, you will know your home is too humid when you see condensation on windows, metal pipes, and walls (particularly concrete walls). · The best way to reduce humidity is with a dehumidifier. A whole-house dehumidifier that works in conjunction with the HVAC can be installed in a new or existing home. The warm, moist air is drawn through the return duct work and cooled. The moisture is removed, and the dry air returned at the temperature of the room. (A bonus is that a dehumidifier reduces dust and the time you spend cleaning, and it lowers energy costs because the air conditioner runs more efficiently. · Change your AC/Heating filters regularly. Dirty filters contribute to high humidity. · Air flowing freely throughout the home also reduces humidity. · Exhaust fans circulate the air and remove moisture from areas such as basements, crawl spaces, bathrooms, kitchens and laundry rooms. · Open windows, weather-permitting, while showering, cooking, washing dishes and doing laundry. · Vent appliances that produce moisture (e.g., clothes dryers, stoves) to the outside. · Open doors to the outside and windows when practical. The fresh air reduces moisture. · Open interior doors between rooms; open closet doors; and move furniture away from walls to facilitate air circulation. · Leave the exhaust fan on (or the window open) during your shower and for 30 minutes after to remove moisture and humidity. Make your basement less welcoming to mold. As it is, it’s the perfect environment: dark, humid, poorly ventilated, lots of food and oxygen. And all that moisture: water lines, drain pipes, sump pumps, and the like. · Remove water from flooding due to heavy rain or burst pipes. Use a sump pump, pool pump or a wet/dry vacuum. After you have removed most of it, soak up the rest of it with cloths or sponges. · Patch cracks in foundation walls. · Clean up dust and dirt accumulations. · Replace damaged sections of perimeter drains (unless they are so deteriorated that the whole system needs to be replaced). · Re-landscape, if necessary, the ground around your foundation so that it is sloping away from the home.